The diamond Mikrobrusher AS 822B has been developed for both microdermabrasion with microcrystals as well as grinding attachments. When microdermabrasion with microcrystals is a controlled, mechanical removal of the upper layers of the skin with microscopic crystals (aluminum oxide, salt, diamond powder, microfine sand). Then the microcrystals and the cuttings are sucked by a vacuum system carefully from the skin. The top layer in our skin, the epidermis produced continuously cells. In a young skin cells newly produced migrate within 28 days to the skin surface. Some of the cells that have reached the top dissolve by itself, but many stick. You are responsible for impurities, for a dull complexion, and much more for comedones They seal off the skin surface, such as a tile roof. Agents can not penetrate the skin and always gets a coarser structure. Microdermabrasion is a highly effective method to remove this tile roof and so to rid the skin of calluses, pigments and small wrinkles or scars. This process frees the pores and follicles. In parallel, the skin receives a pulse, to produce new and fresh cells. The diamond microdermabrasion that originally comes from the medical technology, must be distinguished from the surgical Makrodermabrasion (dermabrasion under general anesthesia in the hospital) and other forms of abrasive treatment (Dermasanding, etc). The deeper layers of skin contact of microdermabrasion a signal amplified to form new fresh cells and the skin regenerates itself from the inside out. The regeneration of inner solves many problems like wrinkles and lines, blemishes, scars, pigmentation and age spots. By removing the keratinization of the skin also has to have the ability to penetrate again care substances significantly lower. The result of diamond microdermabrasion is immediately noticeable and visible. 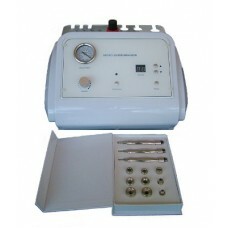 The diamond microdermabrasion is suitable for all skin types. The different fine hygienic Diamond treatment heads are performed depending on the skin s appearance through the skin. Compared to a classic peeling is carried out with this device targeted and absolutely controlled removal of the stratum corneum, pigments and scars. This sensational skin experience is suitable for all skin types and one is immediately after treatment unpresentable. No wonder the diamond microdermabrasion is among the Hollywood Stars in the US on the popularity scale at the top. - Reduction of wrinkles and visible improvement in scar treatments. The Diamond Microdermabrasion is used in the context of many cosmetic treatments such Überverhornungen, light- and age damage, pigmentation problems, bad skin and scars. The delivery of the diamond Mikrobrushers AS 822B in addition to the electronics and control unit includes a case with three handsets and nine essays.